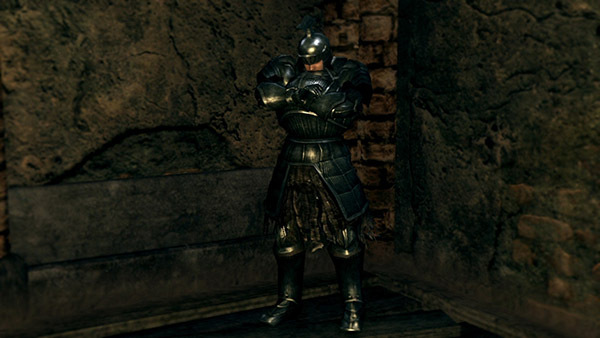 A knight of Berenike, he braves Sen's Fortress to get into Anor Londo, like any other knights before him. But the failures of legendary figures like Rendal of Balder, Black Iron Tarkus, and even Logan of Vinheim makes him skeptical about this whole "Fate of the Undead" business. Now he sells gears stripped from the corpses of the knights he found in the Fortress. At the very top of the fortress is a broken bridge which can be jumped across. It is not an easy jump, best to keep to the left hand side for extra foot space. If the player misses the jump, there is a large platform below with the Sniper Crossbow and some bolts. The fall is not fatal, just frustrating. The broken bridge is beyond the point where the Giant (the one on the top roof space) is throwing large flaming metal balls onto the ground. If you have reached the Giant or Iron Golem Boss, then you have gone too far. Video showing how to reach him. Ah, what? What? Who are you? Ahh, you think you're different? That you can handle it? Yes, I remember that feeling. For I was the same. … So, let me help you out. With your soul-searching. I'm finished. We're both on the brink, you see? End of story. You bloody fool. Let me give you a nibble of advice. Don't even consider visiting Anor Londo. Not in your state. For a century, they have tried, and failed. The Knight King Rendal, Black Iron Tarkus, and even Logan himself. You won't stand a chance. You'll be eaten alive. But, go along, if you wish. If only to deepen your despair! Where do I get all my things? Stripped off the corpses of fools like yourself. It isn't easy. I have to catch them just before they go Hollow. Don't worry. I'll be there to claim your trinkets. Gazing at your final twisted grimace! Gee hee hee hee hee! Hm… Oh, yes, it's you. What is it? Still something you need, eh, anything at all? Still alive? That's a surprise. Anything you want? What's mine is yours, but at a price! Fine then, rush in like a naked babe, and be skinned alive! So, you're that good? Don't need a thing? Bah. it won't be long, before you're begging for mercy. Go along, try and make something of yourself. But nothing will come of it. And I should know! There you go, another brave soul. … Hm, fine, fine. I understand. I have my head about me. What the devil's got into you!